"My treasure? If you want it, I'll let you have it. Go look for it! I left everything I have at that one place!" The dying words of the former pirate King Gol D. Roger, sparked a new age. This is the time that shall be marked in history as 'The Great Pirate Era'. 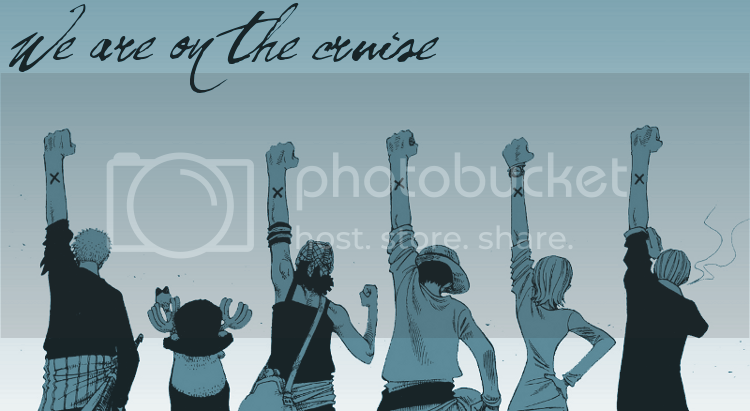 'We Are On the Cruise' is the brand new One Piece roleplaying forum which actively seeks new friends all the time. All characters will be non-canon and unique thus have the opportunity to roleplay out in a universe with no canon characters to take the centre of attention.Here is where you adventure as wandering sole in the great seas. Many more like you dream for wealth, fame and power; all in the One Piece. Around the world, pirates, marines, Bounty Hunters, Revolutionaries and other Organisations battle for power over the world. Only you can shape how the pirate era will change. For better or for worse. Accomplish all your dreams and take your place here! "Destiny, fate, dreams. These unstoppable ideals are held deep in the heart of man. As long as there are people who seek freedom in this life. These things will not vanish from the earth." » Secret of "One Piece"?